Pixe Social, the Maryland based digital marketing solutions provider, delivers impressive results to CapCom, developers of Monster Hunter video game, at San Diego Comic Con (SDCC). The official Capcom SDCC photo booth, powered by Pixe Social, provided successful fan engagement as evidenced in the ROI Analysis Infographic. 2,556 attendee photos were snapped live on the SDCC floor and shared in real-time to the Monster Hunter Facebook Page. Branded with CapCom’s logo, these photos were viewed by an impressively large network of 1.2 million people generating 1.9 million impressions on Facebook in just two weeks after the event. In addition, the fun photos, capturing colorful cosplay and entertaining scenes from show attendees, were liked, shared, and commented on by 330,942 Facebook fans. This is the second time CapCom engaged fans and booth visitors through Pixe Social this year. After boosting the brand’s reach to millions of video game and comic book fans at the Electronic Entertainment Expo (E3) in June 2014, CapCom signed on for the social photo booth solution to extend their viral reach at one of the country’s largest comic and pop culture events. 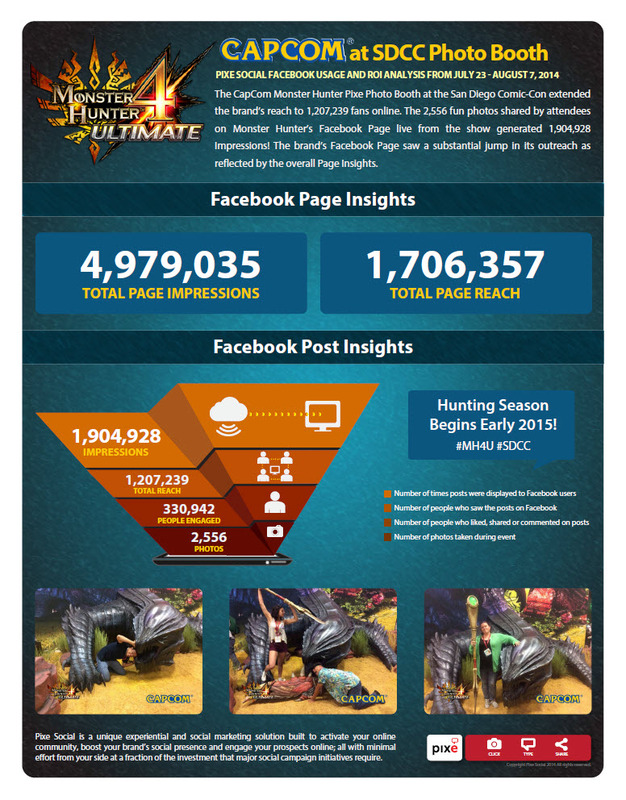 The ROI Analysis Infographic also depicts the exponential increase in activity on the Monster Hunter Facebook Page. The Pixe Social software aided in generating 4.9 million online impressions and reaching 1.7 million fans through the brand’s Page. With the close of SDCC, Pixe software has now been leveraged by a number of international events and exhibiting companies in the comic and pop culture industries, including New York Comic Con, London Comic Con, and a number of MCM Comic Con events in the United Kingdom.